Here’s a 15 minute video covering nearly 5 years of active Mir development in C++. closely after that, really throughout the whole project. This is a video generated by the program ‘gource’. What you see is every file or directory is a node. Little avatars, one for every contributor zoom around the files and zap them when a change is made. If you watch closely, some contributors will fixate on a few files for a bit (bug hunting, maybe?) and sometimes the avatars zap a lot of files during close succession, during feature additions and refactoring. A few things to point out about TDD in the visualization. At the end, the 3 biggest branches are headers, source code and tests. The size of those components remained roughly the same throughout the whole project, which shows that we were adding a test, and then fleshing out the source code (and supporting headers from there). When an avatar zaps a lot of files at once, there’s always a corresponding zapping of the tests tree and the source tree. Write the test first! Very cool to see how things come together with TDD on a large, sustained, and high quality code base. Mir 0.24 was just released this week! We’ve reworked a few things internally and fixed a fair amount of bugs. Notably, our buffer swapping system and our input keymapping system were reworked (Alt-Gr should now work for international keyboards). There was also some improvements made to the server API to make window management better. I’m most excited about the internal buffer swapping mechanism changes, as its what I’ve been working to release for a while now. The internal changes get us ready for Vulkan , and improve our multimedia support , improve our WiDi support, and to reduce latency in nested server scenarios . This is prep work for releasing some new client API functions (perhaps in 0.25, depending on how the trade winds are blowing… they’re currently gated in non-public project directories here). More on that once the headers are released. Vulkan is a new rendering API from Khronos designed to give finer-grained gpu control and more parallel operation between CPU and the GPU. Especially multimedia decoding and encoding, which need more arbitrary buffer control. “Unity8” runs in a nested server configuration for multiuser support (among other reasons). unity-system-compositor controls the framebuffer, unity8 sessions connect to unity-system-compositor, and clients connect to the appropriate unity8 session. More fine-grained buffer submissions allow us to forward buffers more creatively, making sure the clients have zero-copy more often. 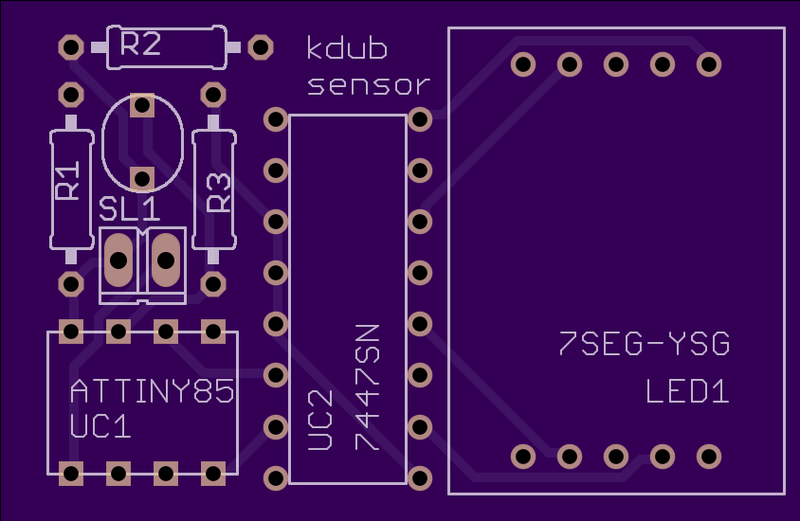 For quite a while I’ve been just using protoboards, or trying toner transfer to make pcbs, with limited success. I’d botch my transfer (as seen above), and have to clean the board and start over again. Chemicals are no fun either. I never really got to the point where I’d say it was easy to do a one-sided board. 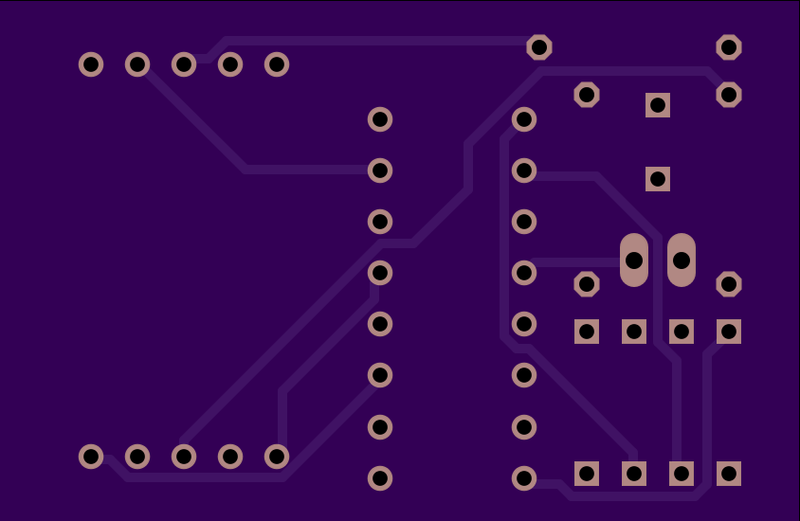 I would always route one-sided boards, as I never got good enough to want to try a 2 layer board. There was no solder mask layer, so You’d get oxidation, and have to be very careful while soldering. Adding silkscreen was just not worth the effort. I seemed to remember trying to find small run services like this a while ago, but coming up short. I might be coming late to the party of small-run pcb fabs, but I was excited to find services like OSHpark are out there. They’ll cut you three 2-layer pcbs with all the fixins’ for $5/square inch! This is a much nicer board and probably at a cheaper cost than I am able to do myself. You can upload an Eagle BRD file directly, or submit the normal gerber files. Once uploaded, you can easily share the project on OSHpark. (this project’s download). You have to wait 12 days for the boards, but if I’m being honest with myself, this is a quicker turnaround time than my basement-fab could do! I’m sure I’ll be cutting my own boards way less in the future.